College basketball already misses Zion Williamson. The NBA-bound superstar from Duke will not play in the Final Four, but he remains a hot topic of conversation ahead of the game’s biggest weekend. 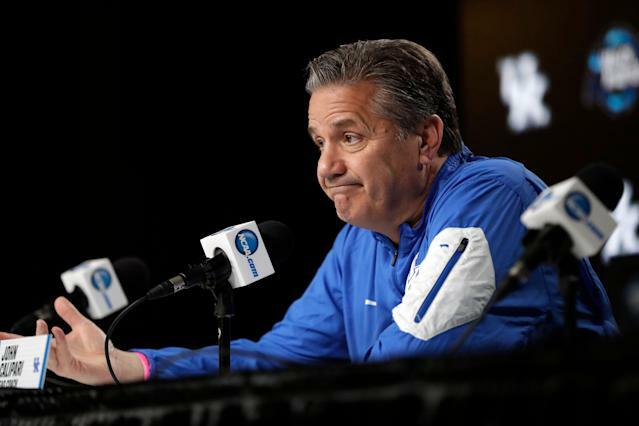 Kentucky coach John Calipari — another college hoops icon whose championship hopes fell short — talked about Williamson on Friday on the “Dan Patrick Show” and gushed over the player he missed out on along with North Carolina, Clemson and other suitors. Calipari admitted that he, like most of the basketball world, somehow underestimated Williamson’s other-worldly basketball talent. When did Calipari realize how good Williamson was? Around the time Duke walloped Kentucky, 118-84, in November’s season opener that officially announced the arrival of Williamson as the baddest man in college basketball. Williamson posted 28 points, seven rebounds and two assists in his NCAA debut that included multiple entries on the highlight reel. “When we played against him, I walked off the court and said ‘I missed on another one,’” Calipari told Patrick. “I knew he’d be good. I watched him, I said he’s gonna be alright. He’s gonna be good. Indeed, Williamson was and remains off the chain. But with his absence this weekend, the basketball world will have to wait until his anticipated NBA debut in the fall to further experience his transcendence.